According to recent survey done by the National Association of Home Builders (NAHB), a whopping 78% of all home renovations requested by customers involved the bathroom. It’s no secret that families want a clean, elegant and updated bathroom, but this study goes to show the true popularity of bathroom renovations. But some homeowners avoid projects such as this because they fear that it will cost a small fortune. While certain renovations tally well over $10,000, there are others which are more affordable for people wanting to redo their bathrooms. Some people may turn their head at the thought of installing brand new flooring in the bathroom, but it’s actually a rather inexpensive project. As long as you can perform the installation yourself, new flooring is an excellent bathroom renovation that will add more aesthetics and ultimately more value to your home. The key thing to remember is that you want to choose a waterproof flooring option, such as ceramic tile, to avoid future damage. Another important bathroom renovation that won’t break the budget is bringing in more light. Replacing the overhead fixture with a larger, more luxurious model will instantly improve the decor. Depending on the size of your bathroom, you can even install a miniature chandelier for a truly opulent look. If you aren’t satisfied with the illumination of a new overhead fixture, don’t be afraid to compliment it with a floor lamp strategically placed in the corner of your bathroom. You really can’t find a bathroom renovation that’s cheaper than installing new towel holders. For about $20 bucks or so, you can pick up some stainless steel towel holders for your bathroom. Rather than simply replacing your old ones with them, try moving them to a new location. Having your towels in a new location of your bathroom will change the decor up with a fresh new look. You might be surprised to learn just how inexpensive some vanities are. 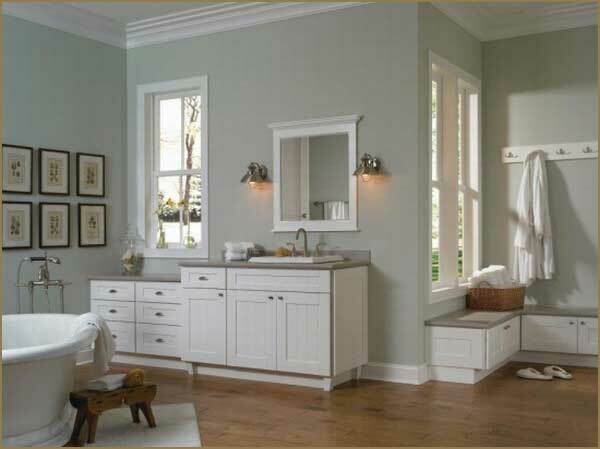 If the current vanity in your bathroom is old, damaged and/or outdated, then perhaps you should upgrade it to a new model. Check some of the local home improvement stores in your area to see what types of vanities they have available for sale. Ideally, you want to choose a model that’s similar in size and shape to your current vanity, as this will make installation ten times easier. Of course, painting the walls of your bathroom is another inexpensive renovation that shouldn’t be overlooked. Going over your walls with a fresh coat of paint will instantly revitalize the decor with more vibrancy. To ensure your paint not only goes on but stays on, you need to prep the walls beforehand. Small amounts of moisture or mildew will cause the new paint to crack and peel. To prevent this from happening, scrub the walls down with a solution of diluted bleach, wait for it to thoroughly dry, and then begin painting.